Recharge your life with better sleep! This is the most comprehensive sleep program ever created! Get all the WHYs and HOW TOs! Includes 350+ page guidebook and 14-day challenge! Plus great bonuses! GET INSTANT DIGITAL ACCESS FOR ONLY $39.99 $19.99! Are You Seeking Better Health? Did you know that not enough sleep could be holding you back from achieving your health goals? Or even making you sick? A whopping 65% of Americans aren’t getting enough good sleep. And beyond feeling tired, stressed and generally pretty crummy, poor sleep increases risk of obesity by 55%, increases risk of type 2 diabetes by 50%, and doubles risk of having stroke or myocardial infarction (heart attack). Healthy sleep improves vitality and mood, gives you energy throughout the day, improves athletic performance and work performance, decreases inflammation, regulates the immune system, regulates hunger and metabolism, reduces stress, reduces risk of disease, and can even help you live longer! YES, SLEEP REALLY IS A WONDER DRUG! In fact, scientific studies show that sleep may be even more important for our health than diet! There is no supplement that replaces sleep, no vitamin or botanical concoction that can counteract the destructive effects that bad sleep has on our bodies. The best we can do is mask fatigue with caffeine and energy drinks–but dependence on these creates a vicious cycle because they only give us the illusion of energy while wrecking our sleep the next night and propelling the problem. So, why is it so easy to give up sleep for anything and everything else? And, even when we are tired enough to go to bed at a good time, why does it take forever to fall asleep? Why do we toss and turn all night? Why is it easier to completely change the foods on our plates than it is to get healthy sleep? The good news is that we can fix our sleep (without giving up coffee!). And all it takes is a collection of small changes to routines and day-to-day choices. THE SOLUTION IS TO GO TO BED!! While going to bed earlier is certainly a great strategy for increasing sleep, the Go To Bed program is about improving sleep. And, it turns out that a series of small changes can add up to huge improvements in our sleep quality and our health! 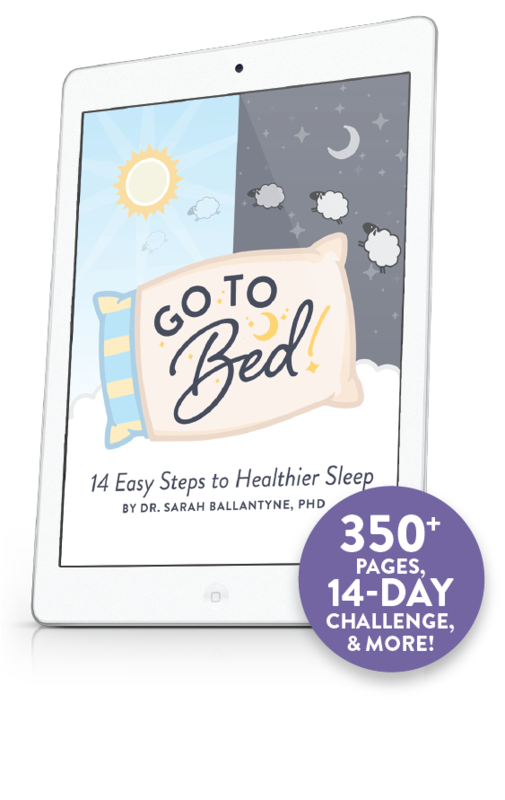 That’s why I created Go To Bed: 14 Easy Steps to Healthier Sleep – to help you get the good quality sleep you need! These are strategies I’ve used myself to fix my broken sleep and regain my health! Sleep was instrumental in my 120-pound weight loss and my success mitigating a dozen health conditions including autoimmune disease, asthma, and pre-diabetes. 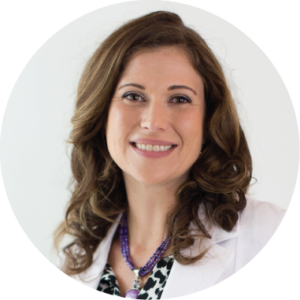 But, the Go To Bed program isn’t based on my personal experience; it’s based on hundreds of scientific studies that look at the connection between sleep and hormones, neurotransmitters, metabolism, and inflammation. That is one of the reasons why I’ve decided keep the price for Go To Bed so low: I truly believe that this e-book should be in the (digital) hands of anyone and everyone who is worried about their health (not just their sleep). With this program, you’ll learn how much sleep you actually need and how to get it! Even more importantly, you’ll learn what small changes you can make during the day to improve your sleep at night! WHAT IS THE GO TO BED PROGRAM? the most comprehensive guidebook ever created for improving sleep, with the detailed science of sleep for optimal health and every scientifically validated tip and trick for improving sleep! 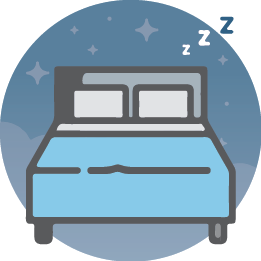 And, with the 14- Day Go To Bed Sleep Challenge, you’ll add one small change every day to add up to big improvements in your sleep in just two weeks! 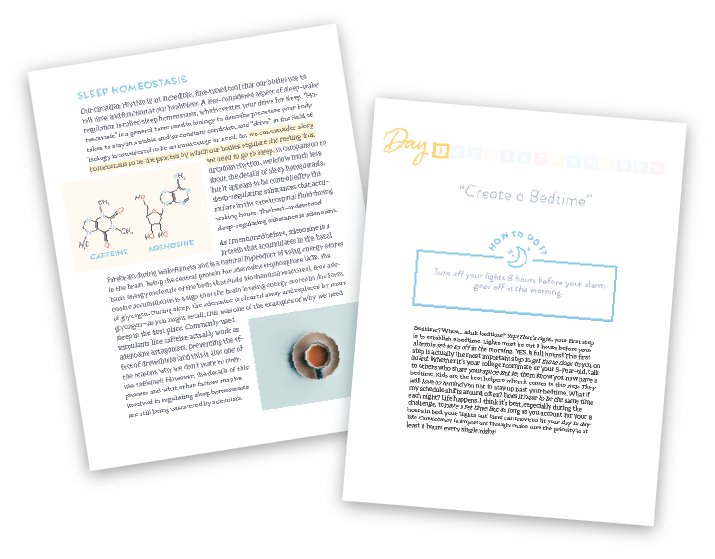 Plus, if that doesn’t get you enjoying awesome sleep, Go To Bed also contains a huge collection of troubleshooting strategies and biohacks for common sleep challenges! JOIN A GROUP CHALLENGE ANY (AND EVERY!) MONTH! p Challenge from knowledgeable page administrators and a community of your peers! It doesn’t cost anything to join a group challenge and you’re welcome to join them any and every month! 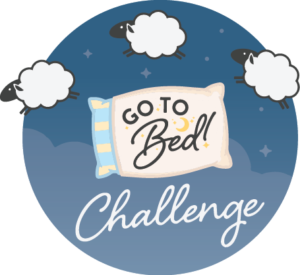 And, of course, with the full program, you’ll have everything you need to successfully complete the 14-Day Go To Bed Sleep Challenge on your own too! This program is valued at $39.99 but you can get instant digital access right now for only $19.99! Includes 350+ page guidebook and 14-day challenge! Plus an amazing resource toolkit!